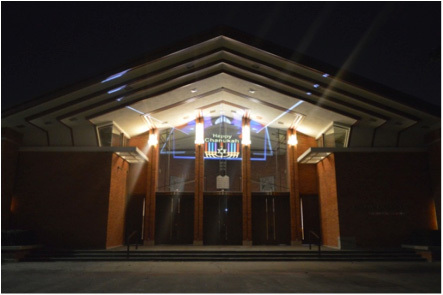 Challenge: Congregation Emanu El wanted an animated light display projected on the huge windows over the temple’s front entrance. Solution: Based on the size of the windows and the power and brightness needed, the installer, Ezscreen chose the Optoma X600. Results: Ezscreen converted the clear glass windows into a bright, high fidelity ‘movie screen’ quickly and inexpensively using their AnyView™ rear projection screen film.